Our searchable rental inventory is here. If there is a video you are interested in renting from our store please call us at (203) 287-9286. We no longer rent movies by mail. Basic membership is FREE. Rentals are $4.50 for two nights; $6.05 for two nights for box sets. * Credit card number needed for security deposit. Members agree that, following notification, credit card may be charged for late fees/video replacements . $108/year (or $10 per month) Take out 1 movie at a time for four days—exchange as often as you want. Attend 1 show per month free. No late fees! For a limited time, if you opt for the annual payment, you get two additional free months if you purchase it in the store or 10% off the cost for12 months if you purchase online. $216/year (or $20 per month) Take out 2 movies at a time for up to a week. Attend 2 shows per month free. No late fees! For a limited time, if you opt for the annual payment, you get two additional free months if you purchase it in the store or 10% off the cost for12 months if you purchase online. $324/year (or $30 per month) Take out 4 movies at a time for up to a week. Attend 4 shows per month free at Best Video Performance Space. No late fees! For a limited time, if you opt for the annual payment, you get two additional free months if you purchase it in the store or 10% off the cost for12 months if you purchase online. You can already sign up at the store for the annual or monthly plans and now you have a way to sign up for the monthly plans online. * All plans are subject to change. Films not returned within a reasonable time are subject to a replacement fee at the retail cost. If you choose not to sign up for one of the three plans, you can continue with your current plan or rent on a pay-as-you-go basis. Prices in the legacy plans and per movie are subject to change. We ask that marked new releases be returned in 1 or 2 days. • Lyric Hall: 827 Whalley Avenue, in the Westville section of New Haven, with easy access from the Wilbur Cross Parkway (at Exit 59). All returns must be deposited in the drop box by 5:45 p.m. on the day they are due. 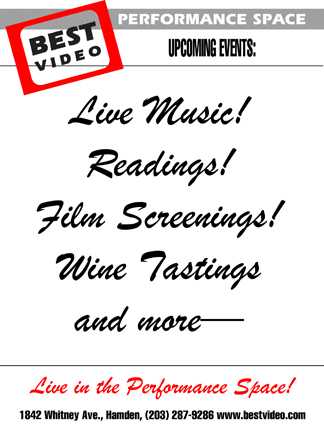 RENT THE BEST VIDEO COFFEE BAR AND/OR PERFORMANCE SPACE! HAVE YOUR MEETINGS IN EITHER SPACE – OR BOTH! IDEAL FOR BOOK & MOVIE CLUBS, SCREENINGS, REHEARSALS & ART OPENINGS. Catering provided with 7 day notice. In-store promotion available. No charge (for coffee bar) if during its business hours. $100/night for Performance Space (including Coffee Bar); $50/night for Coffee Bar. PA system/50” plasma TV included.